Yorkshire Terriers have some of very unique traits that differ from one to another, and I have plenty of them coming through my grooming shop. Their coats can vary from smooth and silky, to wavy and textured, and it all hinges on genetics. This also presents us with some unique challenges, as there is more than one way to groom and care for a Yorkie - depending on their coat type. Based on my years of experience working with (and owning) this specific breed, I've come up with some well-researched solutions and grooming secrets that I'll share with you today. 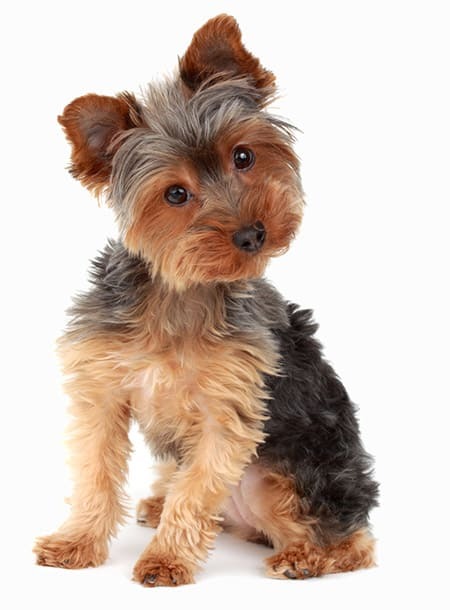 Do Yorkies Have Hair or Fur? No. At least, not in your normal fashion. 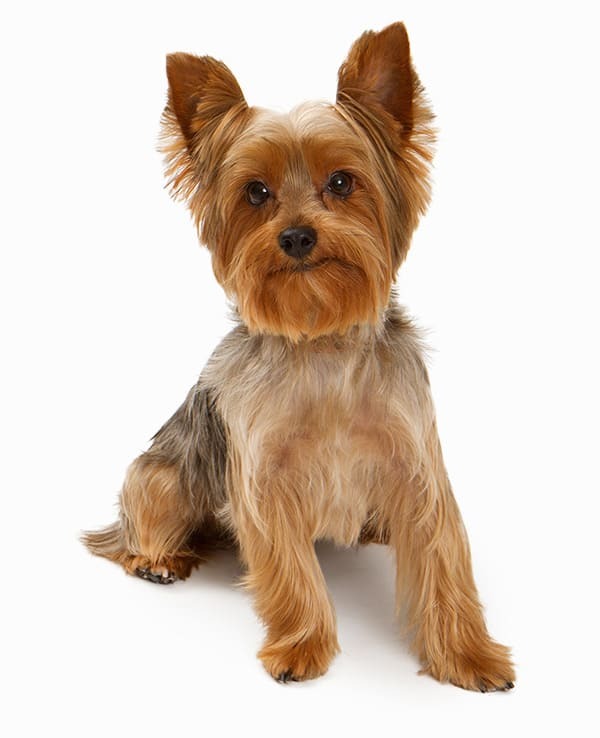 Yorkie hair more closely resembles human hair than other furry dogs. So you can expect to find loose strands of hair from time to time, but no where near the level of shedding of other dogs with fur. However, it depends on the severity of your allergies. It's common to assume that allergies are triggered from dog hair, when in fact allergic reactions stem from pet dander, saliva, and urine. ​Therefore, no dog is 100% hypoallergenic, as all dogs produce some level of pet dander. That being said, Yorkies have significantly less pet dander than other breeds, and people with mild allergies may find a Yorkie is the perfect companion. Pet dander can be even further reduced through regular bathing, brushing, and feeding a high quality diet. Yorkies have hair, not fur. What's the difference? Typically, dog's with fur are considered Double-Coated (Labradors, Huskies, German Shepherds, etc..), where they continuously grow and shed coat and leave bits of fur all around your home. These dog's do not require hair cuts as their hair reaches a maximum length and then is shed or brushed out. 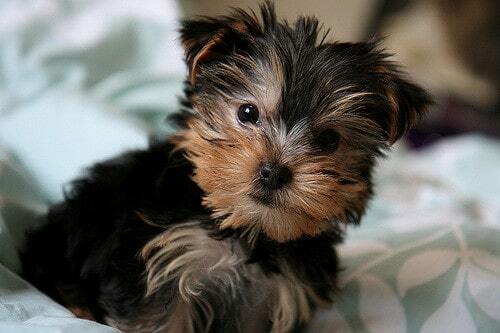 Yorkie's are a Single-Coated breed, and more closely resemble the hair of humans, which can be fine, long, and silky. Just like human hair, it grows continuously, needs to be cared for, and eventually trimmed or shaved. Dogs with hair are considered "non-shedding", and while they do shed in small amounts, it's significantly less than their double-coated cousins. 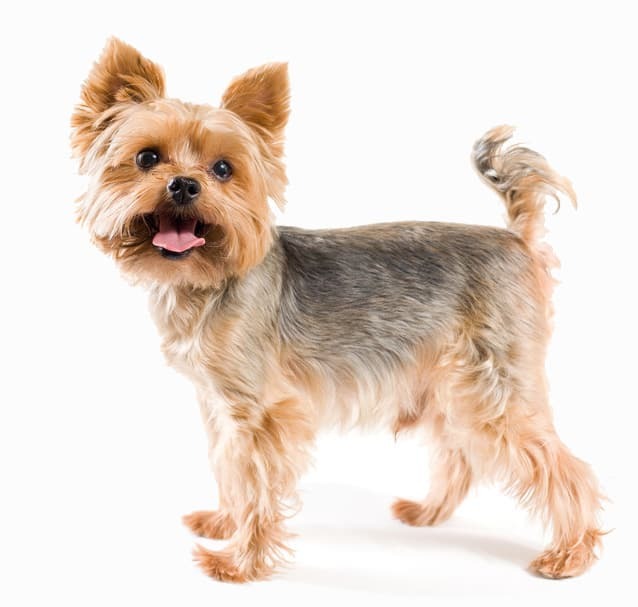 The Yorkie puppy coat is significantly different in color and thickness to their adult coat. The first thing you'll notice is darker features, with prominent black markings and tan highlights. Most often these features will fade over 24 months as they grow into their adult coat. They'll also be thicker and softer, this is common for all puppies. As they're introduced into our world their soft coat acts as an extra barrier to keep them warm and protected until they grow into their adult coat. 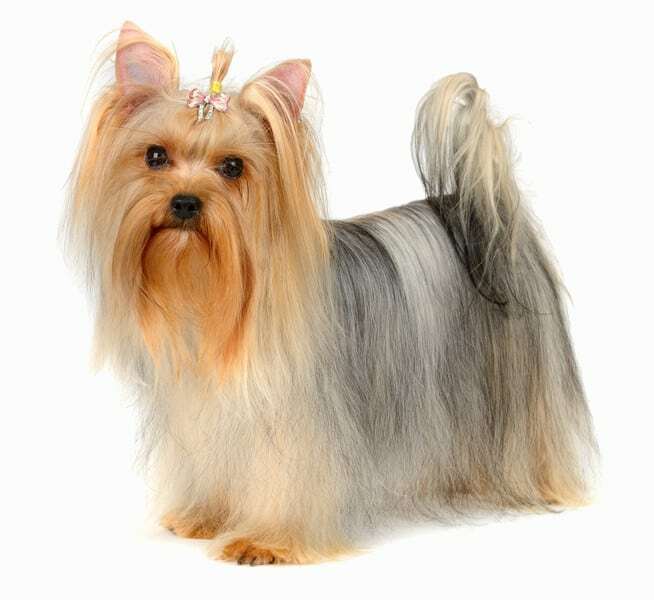 Yorkshire Terrier's with silk coats are considered to have met ﻿show ﻿dog standards ﻿as set by﻿ the American Kennel Club. The desirable traits ​is presenting a proper show groom with hair that is long, straight (with no waves), and glossy (with an almost metallic sheen). 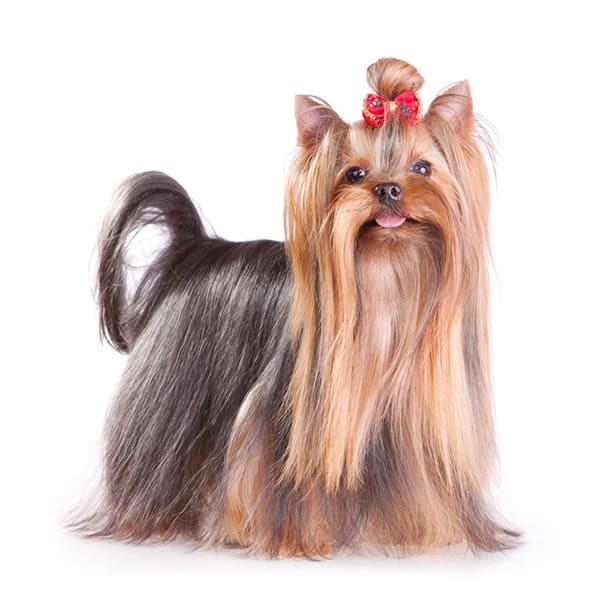 ​Silky coats are carefully groomed to create a skirt of hair that evenly touches the floor, along with long flowing muzzle and head hair - which is tied back in a bow. Also sometimes referred to as Wooly, or Wavy coat, these types will not brush out long and smooth like a Silk coat, instead this coat is thicker, wavy, and textured. In most cases, these types of coats generally do not grow past a few inches, and can almost appear double-coated. Furthermore, they are far more prone to mats, and need to be thoroughly brushed every three days, and groomed regularly. As a professional groomer I have two distinct ways of brushing out a Yorkie, and it all depends on their coat type. Here is my method of getting out all those mats and making your pup beautiful again. 1. First, inspect your dog's coat for mats. These types of coats are prone to mats in areas with a lot of friction (groin, armpits, and around the neck). Also keep in mind these are sensitive areas, so if the mats are too thick you may have to shave these areas out, or speak with a groomer to assist you. 2. Simply use a small, high quality slicker brush and use it to brush towards the growth of the coat, not against it. Do not go over the same spot more than 3 times with a slicker, as the pins may irritate their skin. Work through the entire coat, the dense pins of the slicker will break apart mats as you brush. 3. Next use a grey hound comb and gently run through their entire coat, searching for any mats or tangles you may have missed. This is simply a long pinned comb that gets deep into their coat and is great for seeking out those hidden mats. 4. If you're having difficulty getting through some mats, try bathing your dog and applying a dematting conditioner directly to the ​tangled area, and letting it stand for 5 minutes before rinsing. Towel dry your dog, and while still slightly damp attempt to brush out with a slicker brush. 5. If the mats are still too thick or causing pain, you have reached the point of no return. Ask your groomer to shave out the matted area or simple have them do a kennel cut / shave down. 6. Use a slicker brush every 3 days to keep them clear of any future mats, and pay close attention to the groin, armpits, and where they wear a collar or harness. This process is called Line Brushing, where we brush out individual "strips" of their coat to ensure all the hidden layers of hair have been worked through and are free of mats. 1. Have your dog lie down on their side, make sure they are calm and rested. 2. Start 2/3rds down their body, and using your grey hound comb gently brush up and away from your body to separate the hair and create a horizontal line where you can see their skin. 3. While maintaining this line, comb through all the hair below the line until your comb can glide through with ease. 4. Now separate a new strip just a few inches above, and repeat the process. Do this for the entire coat on both sides. 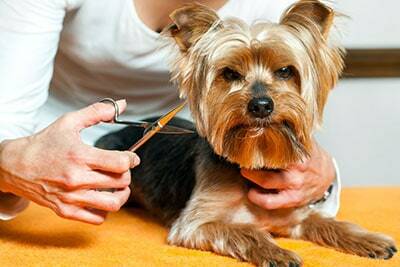 Your Yorkie should be mat free and looking "fluffed" afterwards. Here's a good example of line brushing (on a Sheltie) that demonstrates the technique. Aim to bathe your dog once every 6 weeks. Many of my clients have a schedule of 6 weeks in between grooms which works perfect for keeping them looking great and smelling pleasant. Also note that Yorkshire Terriers tend to have dry and sensitive skin, so use a very gentle moisturizing shampoo/conditioner. As a professional groomer, I have Yorkie's come into my shop everyday, and it almost always comes down to these 5 different grooms. If you're bringing your dog into the shop for the first time just ask them about these grooms and see if it's possible for your specific Yorkie, and don't be afraid to ask for adjustments. Show grooms are long flowing coats, ​that are left mostly uncut and finely brushed everyday. Their coat flows past their feet and will drag slightly on the ground. These are grooms used to show your Yorkie, and follow American Kennel Club standards. Unfortunately, only those with a silk coat can achieve this look. Those with Cotten/Wire coats are too wavy, and typically don't grow long enough. Similar to a show groom, but the head and mustache are cut much shorter, and the skirt is cut so it just hovers above floor level. This is perfect for silky yorkies that want to show off their beautiful coat and still be easy to maintain. Sometimes called the Puppy Cut, and by far the most in-demand style in my shop is the famous Teddy Bear cut. The idea is to give your dog a super cute style that makes them look like a puppy again. The entire body is cut to the same length, leaving about 3/4 inch of hair throughout. The feet, mustache, and ears are carefully trimmed to match the length of the body, while the chest area is left with a "bib" of fur. Another favorite, and a very popular style in the hot summer months. The kennel cut is a very short body, while the legs, tail, and head maintain a little length. The mustache and ears are carefully trimmed to about 1/2 inch, while the paws are cleaned up. As the name implies, this groom borrows the guide for a Schnauzer by trimming the mustache and ears a little longer, and leaving a small skirt of hair on the bottom 1/3rd of the body and legs. The upper portion of the body is clipped to 1/2 inch, and a "bib" of 1/2 inch is left on the chest. Adult Yorkshire Terriers generally have one primary color combination, which is "blue" and gold. While puppies are born with black and tan colors. This isn't blue in the traditional sense, but rather a shimmering dark grey color found on the body or "saddle". 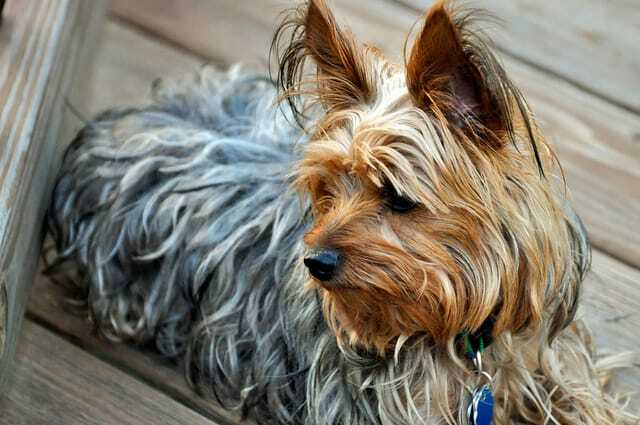 And while Yorkies are known to develop into non-traditional colors from recessive genes, they are extremely rare cases. Puppies will have prominent black and tan coloring, which will slowly lighten and become more brilliant in color as they grow into their adult coat. You'll notice the first changes at 6 months starting with their paws and ears, and slowly changing over the course of a year, sometimes taking as long as 24 months. My 4 month old yorkie got a short haircut. People now mistake her for a snauzer, will her hair grow back to original teddy bear Fluffy look? My 2nd Yorkie is an 8 mo Old chocolate parti and his coat is furry/fluffy . Is there a cut for him? I have a registered Yorkie and her tail is cut off is this the way it should be. My yorkie Sophia is 13years old, she is on a urinary so diet, trying to find out why she is losing her hair, is it her age? My yorkie smells bad just 3 or 4 days after a bath. Also, he bites and scratches sometimes. He does not have fleas. Take him to groomer every 3 wks. And to vet regularly. They seem to be at a loss as to what to do. Can you help? Mine smells bad too shes 5 years old 4 pound 7oz what strong shampoo can I use .I take her a bath and cant get the order off even with dog shampoo n deodorizer perfume? Help me its embarassing .So cute to pick up but stinks. When I had this problem a decade ago a product called Angel eyes worked to make her entire body stop smelling. My vet said there was a bacteria in tears that could cause odor but she smelled everywhere! Still, I put it in her food and it stops the problem. If your dog has sensitive skin I’m not sure how it will react to any product but maybe worth a try? My vet put mine on Fish Oil. Stopped the hacking and scratching and biting, and he had a terrible smell that went away too. She thought itight be seasons allergies. Whatever, it worked. I had a shih Tzu that smelled So bad I had her groomed weekly, but people still didn’t want to pet her! I got a product that at the time was called miracle coat or miracle eyes. I put it in her food for several months, but after The first month I could tell it was a lot better! I don’t think it was only the tears that were smelling. But the bacteria that makes the tears smell, also seem to make the whole dog smell! I did this over 10 years ago so I don’t know if the product is around; but try a specialty shop (It was available online and in expensive pet boutiques for about $25 a small bottle.) I don’t want to recommend a specific brand, but find something oral (reputable, not made in China) that is used to stop the smelly tears, you will probably get the smell off the whole dog! Whatever the tear bacteria is, it seems to make the little dogs really unpet-able! After the first year I didn’t have to use it at all. It’s seemed to have gotten rid of the bacteria. I just posted that it was a miracle eyes that got rid of the bacteria causing smell. My daughter reminded me that it was called Angel eyes. Research shows me now that this product has an anabiotic in it. If your dog is tolerant to antibiotics it might work! Or you could ask your vet if an antibiotic could work. My vet couldn’t smell it- he was smell-blind. But no one who wanted to pet her agreed! 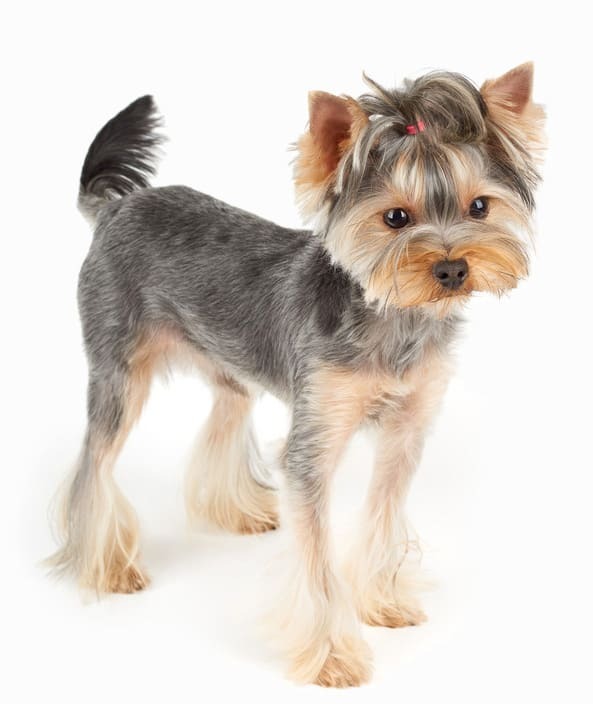 I love this site my Yorkie has lost the hair right in the middle of her back from biting scratching I appreciate the site I’m going to try the gentle shampoo and conditioner and see if they will help her and the vitamin e pill thank you for this site. I let my yorkies hair grow pretty long for the first time. It looks great. She sorta looks like chewbacca most of the time. But I’ve been having trouble with hair ties etc. (head hair) I’ve bought all different kinds, but I’m not great at putting them in. She almost always shakes her head right after i do it, so half the time they fall out right away. She cant really see without them. Any tips? Or should i just cut it? To most people on here with their yorkie skin problems ..look into feeding organic good not the majority of commercial food in stores. Acana, Orijen, maybe Newman’s Own…natural organic is excellent. My Yorkie had dry skin, suffered seizures, bad eyes and ears at times, took him off commercial food, he only eats organic homemade food, with his organic vitamin and mineral supplements, filtered tap water, organic treats…he has zero symptoms now. My little man won’t let me brush,nails,or teeth, He seriously goes from this sweet Angel love bug to Cujo when you try to taje care of him in any way. I do make him let me clean his eyes and am scared from it. It scares my why i force him he gets so worked up his heart pounds, he coughs and has trouble breathing so I stop bc he can have a heart attack and he’s only 4. I bring him to groomer but I’m so scared bc of the horror stories. IS THERE A SHORT HAIRED YORKIE, OR DID I GET TAKEN. I BOUGHT A PARTIE YORKIE SO I THOUGHT BUT HE HAS SHORT VERY SOFT HAIR. IS HE A YORKIE??? My yorkie is all black with a silky coat. Are there many black yorkies?